It's wonderful what desperate humiliation will do. 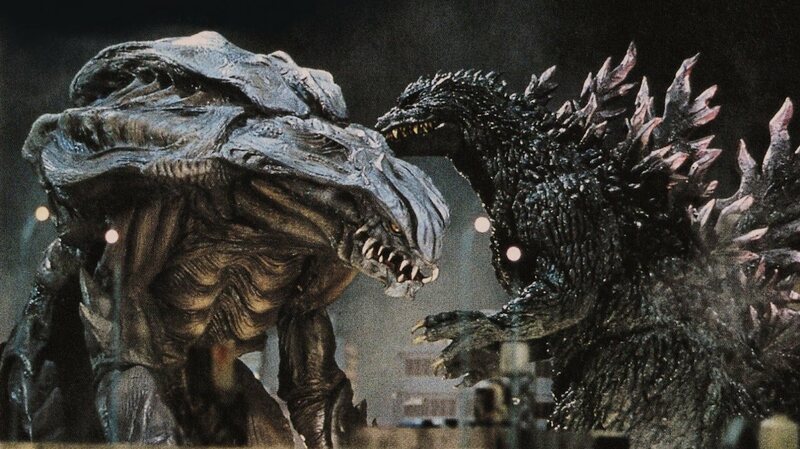 1995's Godzilla vs. Destoroyah was announced and sold, with great purposefulness and gravity, as the final Toho-made Godzilla film until the character's 50th anniversary in 2004, while the Japanese company would silently remain on the sidelines as Tri-Star over in Hollywood made its own trilogy of movies with their reinterpreted version of the character. When the 1998 Godzilla came out and fizzled, it made such a mockery of the character - they took the "god" out of Godzilla, in the later words of the series' guardians, turning a figure of awesome destructive power beyond the human sphere into a giant hungry animal - Toho immediately threw all of their weighty proclamations into the bin and flung themselves straightaway into making a new movie where the great kaiju would be played again by a man in a suit, and have not a damn thing to do with irradiated iguanas. The result was Godzilla 2000: Millennium, which opened in Japan in December, 1999, not even a year and a half after the American Godzilla came out in that country; it created a brand new epoch in Japanese monster movies, the Millennium Era, the last to exist so far. The film was patently designed to clear out the foul taste of the Roland Emmerich & Dean Devlin botch, and in this it was successful, though it's hard to imagine what wouldn't have been. The film was a massive hit in Japan, massive enough that for the first time since Godzilla 1985, the film was given a theatrical release in North America (with the aid of the 1998 film having primed the pump, no doubt). This happens to mean that first time since Godzilla 1985 we also have to deal with a significantly different cut prepared by the U.S. distributor, TriStar, under the undeniably cleaner title Godzilla 2000. There's a little bit of good and a little bit of bad to this localisation, and for my tastes the bad outweighs the good: having concluded that 'Murkins liked our Godzilla films to be good and silly, on the model of the '70s films (the VS Series weren't available in the States in any sort of legal capacity until the very end of the '90s, making it virtually impossible for most fans of the character to have any well-formed opinion on the matter), the studio elected to dub the movie with a deliberately hokey, joke-filled script that suggests the easygoing matinee camp of Ebirah, Horror of the Deep and its descendants, and not at all the serious, damn near mordant tone of the Japanese original. 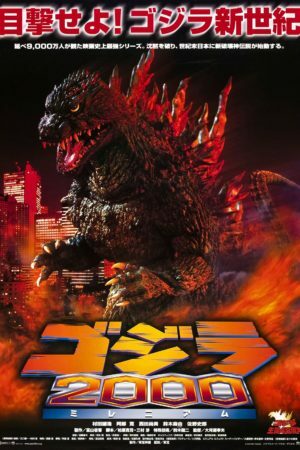 For fairly inevitable reasons, Godzilla 2000 was the first Godzilla film I ever saw in a movie theater (prior to 2014, the only other was the 2004 revival of the Japanese cut of the original Godzilla), and until watching it for this very review, I had only ever seen that American dub; the shift in tone is absolutely mind-blowing, and the English-language version is a humiliation and willful act of disrespect in comparison. So that's the bad. The good is that the American cut snips 8 minutes out of the movie for general-purpose pacing reasons, bringing a 107-minute film down to 99 minutes, and at the risk of seeming a philistine, the tighter version of the film is better, without itself being anywhere close to perfect. The Japanese cut - the only one I will henceforth be concerned with - is at times a downright lugubrious film, seeking to restore the gravity and impact of the great monster Godzilla that was so horribly stripped from it by the terrible events of 1998 by slowing everything down and going seemingly out of its way to never permit things to be too much fun. The sheer drama and sense of awe that the movie goes for is deeply admirable, and Okawara Takao's direction (his fourth and final Godzilla film) reaches some extraordinary heights of visual sophistication and tonal management: I think, for example of a shot of the human protagonists driving down a road at night, away from the monster, whose silhouette plods along in the background against a deep dark orange sky, and I am literally chilled by the sublimity of the moment. By the same token, the drama and awe are effectively unrelenting, and G2K: Millennium is left, frankly, mirthless and lumbering as a result. Let's put that on hold for a minute to take a quick look at the plot. This first film of the Millennium Era sets the rule that will guide all the rest of them: it is totally without inter-series continuity. The 1954 film took place in its backstory, but nothing else did, and this film itself informs none of the subsequent movies. I like this, honestly. It reminds me of superhero comics, where almost all of the very best work comes in the series explicitly tagged as being one-off stories that don't need to take place in reference to any other stories ever told about that character. It frees up a certain flexibility and sense of experiment, a "what if we do this?" approach that lets the filmmakers explore different things to do with Godzilla that might not work at all if they had to be sustained. In the particular case of this film, that realm of openness and possibility hasn't been exploited to nearly its full potential, largely because the opening act presents such a dithering, unfocused depiction of its baseline reality. Apparently, Godzilla attacks are not an infrequent occurrence now, since there is a group called the Godzilla Prediction Network set up with the sole purpose of, y'know, predicting Godzilla attacks; but this group is a rinky-dink operation consisting of, apparently, nobody but Shinoda Yuji (Murata Takehiro) and his young daughter Io (Suzuki Mayu). So maybe it's just a fringe crackpot group; but then, reporter Ichinose Yuki (Nishida Naomi) has been assigned to follow the Shinodas as though they were important, newsworthy figures. And yet, if Godzilla is such an all-present threat, why doesn't Japan's infrastructure, done in by 46 straight years of monster attacks, seem to be even moderately compromised? None of this questions appear to be of even tertiary concerns to writers Kashiwabara Hiroshi & Mimura Wataru, who blast though what I am forced to call "exposition" solely because it comes first in the movie, moving through a clever and exciting initial appearance of Godzilla to get to the good stuff: the hour or three or four in the middle of the movie when nothing much happens. Or rather, what happens is that Crisis Control Intelligence, an all-purpose defense agency, finds a peculiar asteroid at the bottom of the ocean, which turns out to be a rock-encrusted extraterrestrial ship. The aliens - Millennians, they are called, but not anywhere in the movie that I noticed - immediately set themselves to the task of stealing all the available human research into Godzilla, and into studying the monster itself when it attacks them; finally, after an hour of all this being reported to us by terrified lab technicians, the Millennian ship actually does something, using Godzilla DNA to create giant alien kaiju that quickly mutates into a horrid mass of teeth and deformed tissue named Orga, which fights Godzilla throughout Tokyo in a battle so terrifically staged and beautifully shot that it manages to at least temporarily wipe clean all the memories of what a very long trek it took to get to this point. Incidentally, the generally impressive quality of all the practical effects (the fairly extensive use of CGI hasn't aged all that well, though I definitely remember liking it in 2000) sets me up with a little rant: in the six films making up the Millennium Series of Godzilla films, there were four different special effects directors. Which I imagine had to do with the desire to make distinct identities for the movies, or some such, but as the careers of both Tsuburaya Eiji and Kawakita Koichi demonstrate, there's such a thing as effects that improve with the effects team's increasingly familiarity and comfort with the character. Never letting any one director build up a head of steam, as it were, in this run of Godzilla films seems like it needlessly hampers the heights that could be reached with some practice and increasing ambition. But as I was saying, I do very much like the effects work here: great models, solid CGI, and a fine performance by Kitagawa Tsutomu in the Godzilla suit; for all that it was his first time, he did some pretty good work creating the rather amorphously-described "Godzilla as a force of nature" of the new series, something both animalistic in its movements, but also with a thread of intelligence and intention - the way that Kitagawa rocks his head around as Godzilla "works up" a mouthful of atomic breath is pretty fantastic. And the slim new suit leaves him with plenty of opportunity to move and gesture. The new suit... boy, do I have mixed feelings. The one word that best describes this Godzilla is "scaly": its entire body seems rough and jaggedy, looking more menacing than ever before in a lot of ways (the face is extraordinarily mean and angry), but also kind of feeling a little bit like somebody glued tiny spikes all over a smooth object to make it "serious". And then there is the wholly different matter of Godzilla's dorsal spines, which are gigantic, purple-tinted shards of jagged bone that almost bigger than the monster's torso. I hate, hate, hate the spines on this suit; they are enough to make an overall strong design one of my very least favorite of all Godzillas, simply because there's no angle where you can't see them. It look like late-'90s edginess gone to its most insane extremes, because it basically was just exactly that. Orga is a terrific enough monster, with distorted features and a hideous gaping maw that tries to swallow Godzilla like some kind of hideous hellborn Kirby, that I am willing to concede the terrible Godzilla spines. But it is an ordeal. So, monsters good; humans boring; just about the usual par for the course, though the urgent science fiction boilerplate of the human plot seems exceptionally present, and the designated protagonists unusually devoid of personality, which makes G2K: Millennium seem maybe a little duller and more lifeless than a lot of more-or-less equal Godzilla films. But it is a fine response to the '98 film, quoting it openly (a close-up on Godzilla's eye taken directly from the American film's poster, a scene set in a Godzilla footprint, and so on), and even copying some skyscraper destruction scenes from Emmerich & Devlin's Independence Day, perhaps to prove that they could do better knocking off that team than that team did knocking off them (there might even be a sly joke in the way that this film's equivalent to the ID4 saucers looks uncommonly like a bedpan; but probably not). It did the one thing it had to do, restoring dignity and graveness to the movie monster to end all movie monsters; that it it did not do so in a slightly more effective film taken on its own terms is disappointing, but thing was a bit rushed, perhaps. For this was an emergency situation, after all, and desperate measures were required.